Poh Ern Shih at 9 Chwee Chian Road, Singapore. Poh Ern Shih (also: Bao'en Si) (Simplified Chinese: 报恩寺, Hanyu Pinyin: bào'ēnsì, English: Temple of Thanksgiving) in Singapore had been constructed on a site that had been the scene of much suffering. First, the site had been used by the British as an opium warehouse during the nineteenth century. Second, it witnessed some of the most ferocious fighting of the Battle of Singapore during World War II. British and Singaporean troops staged a final and last stand there, resulting in many casualties among the Allied and the invading Japanese troops. There were many civilian casualties as well. 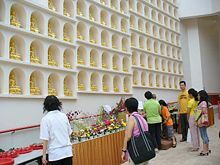 In keeping with the Buddhist faith's commitment to promote peace and relieve suffering, the Poh Ern Shih community constructed the "Thanksgiving" temple. Poh Ern Shih became a pioneer among religious institutions by incorporating both eco-friendly and elderly-friendly designs in their temple. During a major expansion project begun in 2003, solar energy and water conserving features were added. In addition, features making the temple convenient and safe for elderly people were incorporated in the renovations. Those advances come out of Buddhism's tenet that humans need to live in harmony with nature and each other as well as reverence for the elderly. With the renovations to the temple, the Poh Ern Shih community effectively harmonized religion with political and social concerns, achieving an "in-life" relevance while maintaining their spiritual mission. Scenic view of Pasir Panjang from Chwee Chian Hill where the temple stands today, circa May 2007. 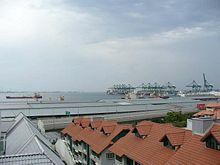 The hilltop where Poh Ern Shih stands today had been a strategic and important location for the British colonial government before the onset of World War II. Bukit Chandu (which means "Opium Hill” in Malay, known as Kent Ridge Park today) faces the hilltop where the British had an opium factory that processed raw opium from the Golden Triangle for sale to China and South East Asia. The sale went through licensed retail outlets owned by citizens of the British Empire and the British East India Company. That factory made major contributions to the coffers of the British Empire, constituting a valuable asset for them. Behind Bukit Chandu sat Normanton Park, an oil depot, where the British stored fuel for their military. A luxurious estate, consisting of lavish homes for the British officers and their families, sat beside Normanton Park. Alexandra Hospital, down the road from Normanton Park, had been a military hospital for sick and injured British soldiers. To protect its strategic interests in the vicinity, the British placed heavy artillery on Chwee Chian Hill in anticipation of seaborne attacks by the Japanese off the coast of Pasir Panjang. During the Battle of Pasir Panjang, Bukit Chandu stood as the last bastion of the 1st and 2nd Battalion Malay Regiment, together with the 2nd Loyals Regiment that defended the western and southern parts of Singapore from February 8-14, 1942. Despite running low on ammunition and food, the Malay Regiments put up strong resistance which resulted in heavy loses for the Japanese invaders. Tragically, the Japanese reinforced forces finally outnumbered and massacred them. A famous Malay officer, Second Lieutenant Adnan Bin Saidi had been captured alive, tortured, and executed by the Japanese. The regiments' heroism has been commemorated at an on-site war museum named Reflections at Bukit Chandu. As a consequence of the heavy fighting, many innocent Chinese and Malay villagers living in the vicinity died in the crossfire. 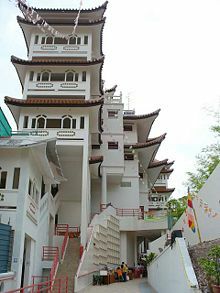 Philanthropist Lee Choon Seng (李俊承) established Poh Ern Shih as a modest single story temple in 1954, one of the few Chinese Mahayana temples in Singapore dedicated to the Ksitigarbha Bodhisattva (地藏菩薩). Based on the noble concept of liberating the spirits of the people who died during the Japanese invasion in World War II, the temple underwent construction at the site of the bloodshed on Chwee Chian Hill. Lee (1888—1966) had been born in Yong Choon county, Fujian province in China. He joined his father in Negri Sembilan as a youth and later moved to Singapore to set up his own property business. Successful in his business, he assumed leadership positions in the local Chinese community. He had been widely known as one of the founders (as Acting Chairman) of Oversea-Chinese Banking Corporation (OCBC) during the Japanese Occupation. Lee became involved in the founding of the Buddhist Publications Circulation Center in 1933 and the Singapore Buddhist Lodge (新加坡佛教居士林) in 1934. Venerable Sumangalo (1903—1963), born as Robert Stuart Clifton in Birmingham, Alabama in the United States in 1903, received his Doctorate in Literature. He lectured on Buddhism in the United States before moving to Asia to further his study of Buddhism. In 1957, he joined the Theravada Order in Laos and received the monastic name Sumangalo meaning "very auspicious." He then left for Malaya and later visited Singapore on a Dharma tour in late 1959 with another American Buddhist monk, Venerable Susiddhi. Through his efforts, a number of Youth Circles and Sunday schools set up locally. In January 1959, he received the offer to serve as the honorary abbotship of Poh Ern Shih, becoming the first Westerner appointed the abbot of a Buddhist temple in Singapore. While in Singapore, he assisted Pitt Chin Hui in her translation of the 'Ksitigarbha Bodhisattva Sutra' from Chinese to English. He return to Malaya and spend his later years at Penang Buddhist Association where he held most of his Dharma lectures. The lectures, later compiled in English and Chinese, has enjoyed free distribution. Due to ill health, Venerable Sumangalo died on February 6, 1963, cremated in Penang. Pitt Chin Hui (1906—1981), born as the youngest child to a wealthy family in Guangzhou in China, came to Penang with her mother to receive her early education. In 1924, she sat for the Senior Cambridge Examination and, while waiting for the examination results, she became an English teacher at the Fujian Girl’s School. In 1927, she left for further studies at the Zhongshan University in Guangzhou. She ended her studies, returning to Penang when her mother became seriously ill. While in Penang, she attended Dharma lectures by Venerable Taixu and his disciple, Venerable Cihang, at the Kek Lok Si Temple and subsequently became a disciple of Venerable Cihang and studied under him. She became responsible for setting up the Maha Bodhi School (菩提学校) in Penang and later in Singapore in 1946 to promote Buddhist education to the young. Besides her school duties, Pitt worked actively as Buddhist worker. In December 1959, she embarked on the task of translating the "Ksitigarbha Bodhisattva Sutra" from Chinese to English at Poh Ern Shih to make it accessible to the English-speaking people. Venerable Sumangalo helped in rendering Chinese and English nomenclature into Sanskrit and offered suggestions for improving the English version. In 1964, Pitt received the prestigious Public Service Star (Bintang Bakti Masharakat) BBM by Encik Yusof bin Ishak, First President of the Republic of Singapore. In 1973, she accepted an appointment as Justice of the Peace by Dr. Benjamin Henry Sheares, Second President of the Republic of Singapore. Pitt Chin Hui also sat as a Vice-President of the World Fellowship of Buddhists. She died in 1981 while on a trip in India. Devotees celebrating Vesak at the Wall of the Golden Buddhas of Poh Ern Shih on May 31, 2007. To meet its expansion needs, Poh Ern Shih demolished its old premises and started rebuilding in 2003 with its office wing completed in April 2007 under its Phase 1 project. Designed by Lee Coo, the architect for the Venerable Hong Choon Memorial Hall of the Kong Meng San Phor Kark See Temple, the new Poh Ern Shih building represents an architectural synthesis of classical features combined with modern technology. From the outside, Poh Ern Shih appears as a traditionally palatial temple, with yellow crystalline globes illuminating its white washed parapets and stairways. Despite its traditional exterior, the true "essence" of the temple in actuality lies inconspicuously within the compounds itself. With a large percentage of its loyal devotees in their 60s, the Honorary President/Director of Poh Ern Shih, Lee Boon Siong, a retired lawyer and grandson of its founder, and its chief architect, made every effort to ensure the accessibility of the temple to the elderly and wheelchair-bound devotees. He constructed a gentle driveway that stretches from the gates to the upper levels of the temple. Details, such as ensuring even flooring on every story by eliminating humps that can cause obstacles to those in wheelchairs, received attention. In the lavatory cubicles meant for the handicapped, 'call-for-help' buttons have been placed within easy reach of any visitor who might require assistance. To that end, those cubicle doors have been configured so that they can be unlocked from the outside in case of emergencies. Solar panels installed at the rooftops of the temple as part of its eco-friendly design, circa May 2007. 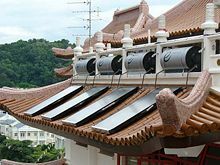 With abundant sunlight potential in Singapore, the temple attempts to tap into that vast resource by positioning three different kinds of solar energy cells on its rooftop. They include the poly-crystalline silicon solar array, mono-crystalline silicon solar array, and amorphous silicon solar array. Poh Ern Shih thus heats its water using the sun's rays that fall on its solar panels and also converts solar energy into electricity for powering the temple's night lighting, thereby reducing its dependency on electricity derived from exhaustible fuel reserves. With its breezy location, wind generators have been raised to convert wind activity into electricity too. Poh Ern Shih thoroughly recycles rain. The rain water collected from surface run-offs and rain gutters not only maintains the temple grounds, it also generates electricity for charging the batteries of in-house motorized wheelchairs. Water from the highest floor of the temple rushes past hydro-generators which then produce electricity from the kinetic movement of the fluids. Furthermore, a purification system has been constructed to filter collected rain water into drinking water. In line with the aim to use renewable resources, the furniture in Poh Ern Shih for its resident Sangha has been assembled from bamboo. Bamboo represents one of the most ecologically friendly materials for use in home furnishing and flooring, as bamboo harvested takes place without felling the entire tree. That eliminates the need for replanting and thereby allowing the bamboo to grow to full height again in five years time ready for another harvest. The second phase of the temple completed towards at the end 2007, featuring a new Main Ksitigarbha Prayer Hall as well as a Guanyin Meditation Hall with lapis lazuli statues and a seven story stupa. Replica of the Sarnath Buddha, depicting the Buddha giving the First Discourse. 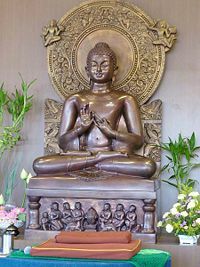 Image was cast in Thailand and located at the Dharma Hall of the Buddhist Fellowship at Poh Ern Shih, circa June 2007. Poh Ern Shih sought partnership with the Buddhist Fellowship, a non-sectarian Buddhist organization, to bring more young practitioners into the community. Known locally for its revolutionary projects and activities, the Buddhist Fellowship strives to ensure that the propagation of the Dharma in contemporary language and form. The alliance began two years ago when the Buddhist Fellowship (BF) rented a space at Eton House in Paya Lebar. The Buddhist Fellowship has a 2,000 plus membership of English-speaking professionals under 45 of age. Lee Boon Siong dropped in for a friendly visit and informed its President, Angie Monksfield, a Chinese Singaporean married to an English Catholic, that Poh Erh Shih had been expanding. He welcomed her fellowship to make use of its premises. In early 2007, Angie took up the offer after their Eton House's landlord had wanted to raise the rent by 57 per cent, a sum difficult for the fellowship to afford. The temple offered rent the same that the fellowship had been paying before the increase demanded by its previous landlord. On May 29, 2007, an opening ceremony attended by Khaw Boon Wan, Minister for Health, and its two spiritual patrons, Ajahn Brahm and Venerable Kwang Sheng (Abbot of Kong Meng San Phor Kark See Temple), marked her group moving into 4,000 sq ft of space in Poh Ern Shih. The fellowship set up its office and conduct programs such as Dharma talks, Sutta discussions and meditation courses by visiting Sangha and notable lay Buddhist teachers such as Piya Tan, Dr. Ang Beng Choo and Prof. Tan Hun Tong. The leaders of both groups agreed that the coming together represents a testimony of the Buddhist way of life—living in harmony and peace despite external differences. ↑ National Archives of Singapore, Reflections at Bukit Chandu. Retrieved August 4, 2008. ↑ Koh, "Renewing the Temple of Thanksgiving," 112. ↑ Oversea-Chinese Banking Corporation, OCBC History. Retrieved August 4, 2008. ↑ Ong, "Lee Choon Seng," 48—49. ↑ 8.0 8.1 Ong, "Miss Pitt Chin Hui," 111—112. ↑ 9.0 9.1 Koh, "Social Consciousness," 113—114. ↑ 10.0 10.1 Koh, "Making Good Use of That Which is Abundant," 114—115. ↑ Koh, "Renewable Resources," 115. ↑ Koh, "What's in Store," 115. ↑ 13.0 13.1 Lee Chee Keng, Two Buddhist groups share space, The Straits Times (2007). Koh, c-u Pinn. 2007. "Renewing the Temple of Thanksgiving," Vaidurya (May/Jun 2007). Singapore: Golden Pagoda Buddhist Temple. Piyasilo. 1992h. Charisma in Buddhism. Malaysia: Dharmafarers Enterprises. ISBN 983-9030-10-8. Piyasilo. 1992. New Directions in Buddhism Today. Malaysia: Dharmafarers Enterprises. ISBN 983-9030-03-5. Ong, Y.D. 2005. Buddhism in Singapore—A Short Narrative History. Singapore: Skylark Publications. ISBN 981-05-2740-3. Venerable Sumangalo. 2006. Lectures by Venerable Sumangalo Bhikkhu (in Chinese). Malaysia: Penang Buddhist Association (Free distribution). Poh Ern Shih (Temple of Thanksgiving). History of "Poh Ern Shih Temple"